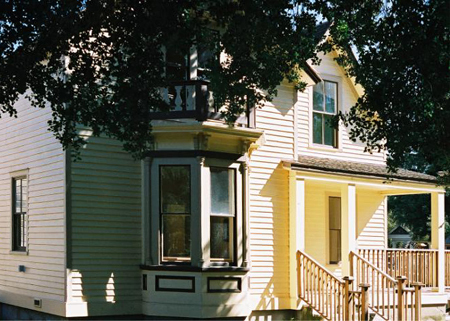 A historical San José landmark, The Edwin Markham House is a Victorian home where the famous poet Edwin Markham lived in the late 1800s. The house was moved from its original site on Eighth Street across from the San José State University campus to the grounds of History Park. On Country Lane, this historic building is now the headquarters of Poetry Center San José. The newly refurbished home was dedicated in 2002 with a ceremony led by Dana Gioia, chair of the National Endowment for the Arts; Bay Area poets Jack and Adelle Foley, and Francico X. Alarcon, California Poet Laureate nominee. The Markham House was the center for an all-day Festival of Poetry at History Park. History Park's Markham House offers an opportunity to gather with others for an informal time of writing the second Sunday of most months from 1 to 4pm with Poets@Play. This playhouse of poets is a way to connect with the local poetry community through writing, reading, and listening. Markham House is also generally open Tuesday afternoons from 1 to 3pm for docent-led tours. The Edwin Markham House contains a collection of poetry books, now over a thousand donated, along with anthologies, reference books, and small press publications. The library is located on the second floor, which also has a reading/writing room equipped with a copier. Downstairs, a resource room contains Markham’s original bookcase, now holding poetry books for children—classics, new publications and reference books for those interested in teaching poetry to their classes. This section has television, DVD’s, and magnetic boards for writing. Our catalogue of books is online and can be accessed by visiting The Naomi Clark Libary through LibraryThing. Books are to be used as reference at the house; they are not available for borrowing. The children’s library was made possible by a grant from Air Systems Foundation, Inc. Both libraries are open to book donations; we ask that you go through your own library and set aside what you can spare. We are particularly interested in California poets and readers who have appeared at Poetry Center San José in past years. The Yuki Teikei Haiku Society library and archives are also housed here. PCSJ members have access to these libraries and open time to use the house for study and writing. Contact poetsatplay@pcsj.org for more information. History San Jose CEO and curator Alida Bray has installed a display of artifacts that includes Markham's poems, his cane, The Lark first edition of his poetry, and a 1920s miniature book. The display highlights Markham’s career and his place in the annals of poetry. In the entry parlor is an original signed copy of Markham’s world-renowned poem, “The Man with the Hoe,” which was inspired by Jean-Francois Millet’s painting of the peasant in his deep abyss of labor. Another framed photograph pictures his good friends Jack London, Joaquin Miller, and Ina Coolbrith. Shawn McAllister of Florida has willed his collection of Markham artifacts to History San Jose and to PCSJ, feeling that it has found a home at History Park. History San José is the primary caretaker of the Edwin Markham House. Our Markham House chair, Dennis Noren, oversees the use of the house. The Markham House garden, designed by Middlebrook Gardens, was planted and mulched the first of 2009 thanks to an army of volunteers that donated, along with the Compton Foundation, funds for the plants, turning the garden into a native plant haven. PCSJ’s membership in the California Native Plant Foundation has made this possible. Poetry Center San José could not exist without volunteers. PCSJ is seeking volunteers to help at Markham House. Docents keep the house open on Tuesdays from 12 to 3pm. This also allows the them time to write and to reference the library and or catalog Markham’s own book collection. If you are interested in volunteering, please email us at volunteer@pcsj.org.